The ad is so well-known it’s become an internet meme. The author of the ad, John Silveira, intended it to be a joke filler when the classifieds in the magazine needed some space filled. The response to the ad has been overwhelming, and the ad’s been featured on the Tonight Show with Jay Leno. Enter Safety Not Guaranteed, which aims to answer the question, “what if the ad was real?” The winner of the Waldo Salt Screenwriting Award at the 2012 Sundance Film Festival, the film is at its core a mumblecore homage featuring several ascending actors; the star, however, is a heartfelt script that relies less on star power than an appeal to our basest emotions. Darius (Aubrey Plaza of Parks and Recreation fame) is an intern at Seattle Magazine who’s foundering in life. Like most 20-somethings, she’s not sure what she wants to do with her life, and she’s stuck replacing the toilet paper in the office restrooms. During a brainstorming session with the editor-in-chief (Mary Lynn Rajskub) one of the writers, Jeff (Jake M. Johnson), mentions a want ad he found looking for someone to time travel. Intrigued by the story, Jeff, Darius, and fellow intern Arnau (Karan Soni) head out on assignment to the small town of Ocean View. Staking out the P.O. box in the ad, Darius manages to track down the owner, Kenneth (Mark Duplass, who plays Pete in one of my favorite shows, The League). Kenneth works at the town grocery store during the day; at night, he’s perfecting his time machine. While both are initially on guard, Darius is quickly disarmed by Kenneth’s earnest passion; Kenneth, on the other hand, quickly warms up to Darius and begins training her for the mission, which is to head back to 2001 and prevent the death of his old girlfriend, Belinda (Kristen Bell). Meanwhile, Jeff tracks down an old high school flame, Liz (Jenicah Bergere), and tries to win her back. As is prone to happen, Kenneth and Darius gradually become closer to each other, and Darius finds herself attracted to Kenneth, who has been a perpetual loner most of his adult life. Kenneth plays her a song he wrote for Belinda (in real life, Mark is the frontman for the band Volcano, I’m Still Excited!! ), and they share a kiss. Meanwhile, federal agents close in on Kenneth, whom they believe to be a spy stealing technology and equipment from different labs around the coast. After their night together, a call from their editor reveals cracks in Kenneth’s story, and Darius then has to choose whether to believe Kenneth is simply a delusional but kind-hearted guy or a passionate man who truly believes in the impossible. It wasn’t too easy for me to explain the plot of the story to my friends without making it sound like a low-budget science fiction film. I think Krisden and Bre seemed a bit hesitant, but thankfully they and Andy kept an open mind. The film itself uses the concept of time travel mostly as a prop around which to center the film, but it’s far from the focal point. The visuals serve their function, and the sound isn’t anything to write home about, but to make anything too elaborate would detract from the purpose of the film. Given a second chance to fix the regrets they’ve had, Kenneth seeks to make the most of it, to find a partner not just for the trip, but for the journey through life. Meanwhile, Darius sees Kenneth’s enthusiasm and tries to believe in something, no matter how preposterous it might seem. It all borders on somewhat corny, but it never strays too far into overly sentimental territory. It’s a terrific blend of humor and sentiment, and we all found ourselves highly entertained by it. The film’s pretty short, clocking in at just under 90 minutes, and if you’re looking for a summer date movie, this is a perfect opportunity. It could be worse; it could be Magic Mike. 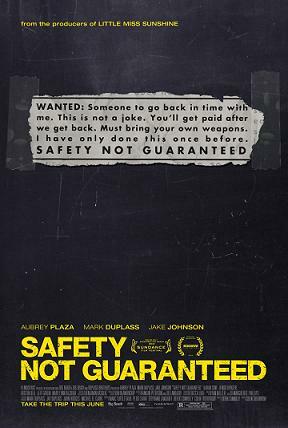 I highly recommend Safety Not Guaranteed if you’re a fan of any of the actors in the movie or are looking for a funny yet poignant film. Safety Not Guaranteed gets a B.